The 2017 NASCAR season marked a new era, and was one filled with plenty of headlines. After nine seasons as the Sprint Cup Series, NASCAR’s premier series was renamed the Monster Energy NASCAR Cup Series. Stages were formally introduced across all three national series. The season-opening Daytona 500 was won by none other than Monster Energy-sponsored driver Kurt Busch in a chaotic fuel mileage race. Kyle Busch saw his rivalry with Team Penske drivers Brad Keselowski and Joey Logano flare up, including a fight with the latter at Las Vegas. Jimmie Johnson moved his way up the all-time win list. The online community rallied together in an effort to vote underdog Matt DiBenedetto and his Reddit car into the All-Star Race. Ricky Stenhouse Jr. won not only his first Cup race, but half of the restrictor plate races. In the Xfinity Series, Jeremy Clements held off highly-funded teams to claim a wild first series victory for the underdogs at Road America. Chase Elliott and Denny Hamlin clashed at Martinsville and Phoenix. By the end of the season, Martin Truex Jr. and Denver-based Furniture Row Racing claimed their first Cup championship after a dominating 2017. 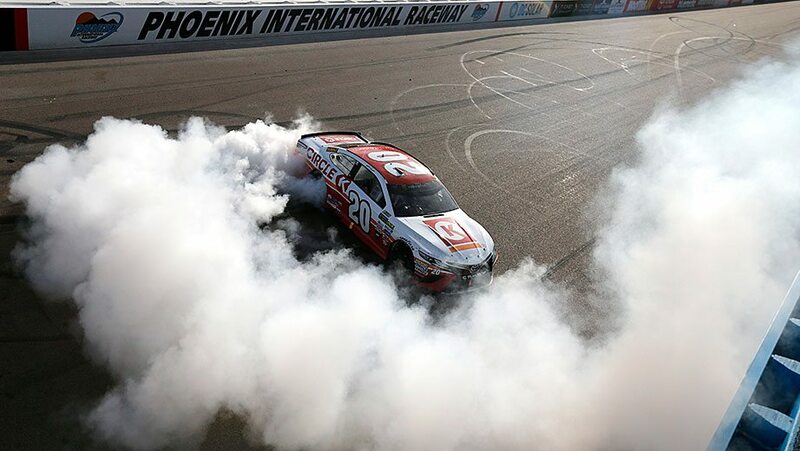 However, what stood out to me the most was Matt Kenseth holding off a playoff-contending Elliott to win at Phoenix in his final Cup win. For much of 2017, it was not a year to remember for the 2003 champion. Kenseth had not won a race since the 2016 New Hampshire 301 in July, and had started the 2017 season with DNFs in three of the first five races. His #20 team made some strides during the year, sweeping the poles at Richmond Raceway and cracking the top ten in points in the summer, though a race win continued to elude the 45-year old. He started the playoffs in 11th place, and top-ten finishes in two of the three Round of 16 races allowed him to move on. In the Round of 12, he saw his championship hopes come to an end at the elimination race in Kansas; after being collected in a multi-car wreck on lap 187, Kenseth’s crew attempted to repair the car before the five-minute crash clock expired, but he was parked for having seven men servicing the #20. In the first two races of the Round of 8, Kenseth proved what could have been as he finished ninth and fourth. In July, Joe Gibbs Racing announced Erik Jones, who was driving the #77 for JGR ally Furniture Row Racing, would replace Kenseth in the #20 for the 2018 season. The move was no surprise to many fans, considering Jones had already driven the car in 2015 on a substitute basis when Kenseth was suspended following an incident with Joey Logano at Martinsville in the fall and was the JGR program’s top young driver, but it left Kenseth out of a ride. As rides continued to be filled with other drivers, Kenseth was left in a precarious situation. As he remained a top-tier driver with championship-contending potential, smaller teams were automatically ruled out. A seat swap with Jones was also speculated, but was shot down when Furniture Row shuttered the #77 for 2018. Rumors of joining Hendrick Motorsports and replacing either the retiring Dale Earnhardt Jr. in the #88 or the ousted Kasey Kahne in the #5 gained momentum, but ultimately dissipated upon the announcements of Alex Bowman and William Byron as their respective successors. Entering the AAA Texas 500 weekend in November, Kenseth declared his intention for 2018: he would be stepping away from Cup racing, likely for good. Kenseth’s departure would mark an ongoing trend of NASCAR’s top drivers leaving the sport, one that dates back to 2015 when four-time champion Jeff Gordon retired. Three-time champ Tony Stewart and eventual championship runner-up Carl Edwards followed in 2016, while 2017 included Kenseth and fellow 2000 Rookie of the Year contender Earnhardt. Between Gordon, Stewart, Edwards, Earnhardt, and Kenseth, a combined 235 Cup wins and eight championships has left the sport in the last three years. The 2017 Can-Am 500 at Phoenix International Raceway would be the penultimate race of the season and the final elimination race before the Championship Round at Homestead-Miami Speedway. To honor Kenseth, the track placed a sign along the wall. The Wisconsinite qualified seventh in the race, but appeared to be a non-factor for the event as Elliott and Hamlin, both of whom were fighting to advance to Homestead, dominated. The two drivers had tangled at Martinsville two weeks prior, placing the two in must-win situations entering Phoenix. In the first two stages, Kenseth finished fourth and second, respectively. Kenseth remained behind Hamlin at the start of Stage #3, and his JGR teammate built a strong lead until a caution came out on lap 230; Kenseth won the race off pit road to inherit the lead from Hamlin. Fellow Toyota driver Truex Jr. eventually joined the fight as the laps wound down, though Kenseth remained the leader. On lap 264, Hamlin and Elliott made contact, knocking the former out of the championship picture when he hit the wall less than 15 laps later. The final restart occurred on lap 282 with Kenseth and Elliott poised to battle it out for the win. After leading the first two laps, Kenseth surrendered the position to Elliott, who appeared to be in position to win his first career Cup race and advance to the Championship Four. However, Kenseth proved to have the dominant car with ten laps to go, passing the #24 on lap 303 and holding him off to win his 39th Cup race and first at Phoenix since 2002. It was an emotional win for Kenseth, one that would eventually be his final Cup victory. He celebrated accordingly, standing on his car’s roof and gesturing to the crowd in jubilation. “Everybody dreams of going out a winner,” he commented. A week later at Homestead, Kenseth and Earnhardt drove special paint schemes honoring their rookie campaigns in the 2000 season to eighth- and 25th-place finishes, respectively. While Junior Nation certainly wishes to have seen their driver end his Cup career on a higher note, Kenseth fans were sure to be satisfied by their driver’s last two races. Kenseth (and Earnhardt) fans, don’t be upset about your driver calling it a career. Cherish those memories fondly and know that it’s okay to be sad about the news; after all, the reason why you can feel upset about it is because you were able to experience to be a fan of his in the first place. At the same time, don’t ditch your love for NASCAR because of your favorite driver retiring. As great as it is to relive the memories of the past, there is still a bright future ahead for NASCAR’s young drivers. Alex Bowman, William Byron, and Darrell Wallace Jr. These are the names of some of NASCAR’s rising stars who have moved up the ladder and will be racing in the Monster Energy Cup Series alongside fellow young guns Elliott, Jones, Kyle Larson, Ryan Blaney, and Daniel Suárez in 2018. There is plenty of talent to go around and plenty of hope for NASCAR’s future. It has been a pleasure watching Kenseth and Earnhardt compete in the Cup Series, and I’m optimistic for what the future holds. Thank you for the memories!